A Natural supplement to help you maintain your healthy weight. Now one product can supply you with all these key metabolism-enhancing nutrients: Suvaril, the twice-daily caplet for healthy weight management. Suvaril is formulated to help promote safe, gradual weight reduction by gently boosting your metabolism. Suvaril's proprietary blend of natural ingredients includes green tea extract, chromium, biotin, and B vitamins, plus other natural ingredients that help enhance metabolism and promote gradual, healthy weight management..
uvaril contains many of the key nutrients needed to help enhance your metabolism. 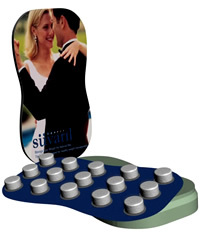 Just two Suvaril caplets each day may help you lose weight moderately and naturally. There is no magic pill that can help you lose weight overnight, and those that make such claims don't have a lot to offer for serious people who want to shape up and feel better about their bodies. Suvaril takes a moderate approach to weight management, helping you lose weight naturally and feel better about yourself. Suvaril helps maintain healthy metabolism levels by supplying key nutrients to the body. The green tea extract in Suvaril helps enhance your metabolism, while Suvaril's chromium and important B vitamins help convert food into fuel. And the biotin in Suvaril helps break down fats and proteins, and convert them into energy. Exercise and eating right are essential to safe weight management. But adding Suvaril to your daily regimen may give you the edge you need to gradually lose weight and maintain your ideal body mass. Order Now!